For the modern-day cannabis-user, the infamous “drug test” can pose a daunting challenge, as it can be difficult to naturally pass. The truth is, company-sponsored tests can force you to make difficult decisions about your health and/or career. Luckily, there are a few (natural) preventative measures you can take to ensure you don’t lose your job on account of ingesting your prescribed medication. For the recreational marijuana-user, there’s really no excuse; you can pass a drug test by simply not consuming cannabis for X amount of time before the test (more on how to determine X shortly). But for the medical user, things become more difficult. Not impossible, but difficult. Drug tests seem to spring up out of nowhere. Your employer isn’t just going to announce to the whole company when it’s time to cut down on those bed-time blunts. All blunts aside, it should cause everyone concern that not even the Supreme Court thinks the rights of medical cannabis patients should be upheld. In a recent unanimous decision by the Colorado Supreme Court, employers still have the power to fire employees if they don’t pass a company-sponsored drug test. In fact, an Oregon TV anchor was recently fired after failing a company test, and she’s since become a cannabis activist (something to do with cannabis still being a Schedule I substance, we guess). 61.8% of U.S. companies conduct drug testing for illegal substances. A drug test CAN typically trace marijuana use within the past week. A drug test CANNOT indicate frequency of use, nor can it detect the severity of impairment or whether the user has substance-abuse problems and should seek rehabilitation. A drug test typically cannot tell the difference between the use of illicit street drugs and the use of legitimate prescription drugs (oh, the irony). A urine test is by far the most common type of drug test administered. Marijuana continues to be the most commonly detected illicit drug. In 2013, marijuana positivity reports for the combined US workforce reached 1.7%. But back to the topic at hand. If you’re a recreational smoker or vaper, chances are, with some due diligence, you’ll find that simply quitting your cannabis consumption ahead of time is the most natural, sure-fire way to pass your drug test. While studies have provided some insight on how long THC stays in the system, the topic’s largely still debated. Despite estimated detection periods provided above, you usually aren’t given the option to delay your drug test. Not surprising, right? How many Yahoo Answer Questions have you read asking for advice on how to get rid of traces of weed in less than 24 hours? 48 hours? 4 days? If you haven’t see any, you should check this out. The sad reality is that for those of us using cannabis to treat severe illnesses and pains, naturally ridding yourself of it for extended periods of time can be a major challenge, even a health risk. In either case, here are some do’s, don’ts, and other tidbits of information we think will help on your quest to naturally beating a drug test. First, we’ll point out that we don’t condone medicinal drug use on the job and we’re not doctors, so don’t take the following advice as gospel. Blood, hair, saliva, urine—pick your poison. Well, as we mentioned before, urine tests are the most widely administered, so that’s likely going to be your venom. Luckily, our most confident suggestion for how to pass (in the most natural way possible) is most compatible with the pee test. Things are already looking brighter, right? Stop consuming cannabis for at least 30 days prior to your test. You really need 90 but 30 days should be just enough time to get your THC-COOH levels below the 50ng/mL concentration level that’ll cause you to fail. What’s more natural than just quitting consumption? Accelerate the process by flushing your system with water 3-4 hours before the test, forcing your body to metabolize the THC-COOH faster. Just don’t over drink because too much water can dilute the urine sample and trigger a re-test. While it’s not exactly commonplace to chug water on the spot, it’s not unnatural to drink water either. Don’t trust cheap “drug screen” products claiming to disguise drug use in your sample. Just don’t. They won’t work and their claims that a highly secret mix of vitamins, herbs, and electrolytes can block your body’s toxins from being emitted through urine is just a bunch of hoopla. There’s probably zero organic value in them and they sure as hell won’t provide a “natural way to pass a drug test!” as exclaimed on their packaging. Don’t spark up a joint right after your test. There’s always a chance something went wrong with your sample and you’d have to take it again. Be safe and try to wait at least a couple days before medicating. Don’t make excuses. False positives are nearly impossible if conducted by a legitimate lab company. 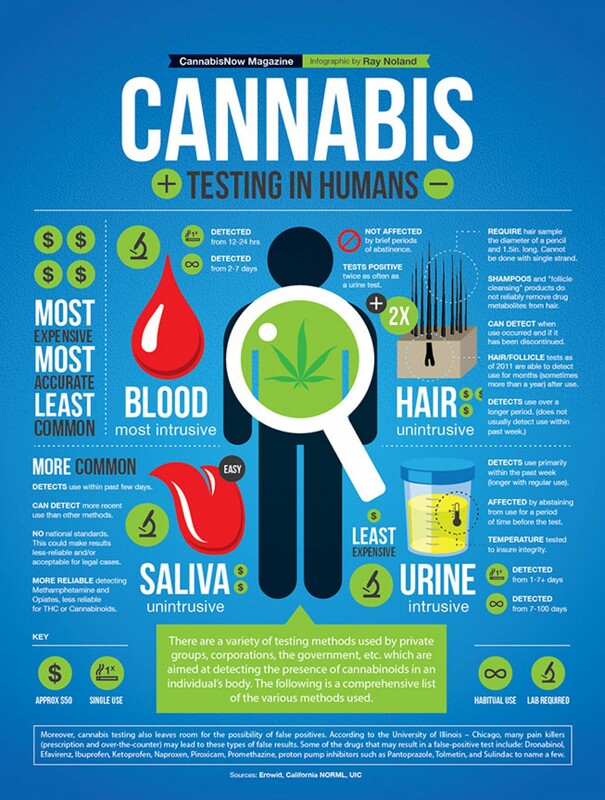 No, the professionals who perform these drug tests for a living didn’t screw up yours; and, no, second-hand marijuana smoke can’t produce enough exposure to influence your urine test. Walk into a lab with fake pee (yes, we’ll admit, this method is completely not natural or normal in any way) and you’re taking a big risk. Unless you know exactly what you’re doing and understand the consequences of being caught, this is a dangerous path to pursue. We don’t know about you, but strapping a urine-filled condom to your thigh doesn’t sound like a walk in the park (although there’s a much more viable alternative to this method, a.k.a The Whizzinator). Tamper with the sample by adding adulterants like Visine, bleach, salt or detergent and risk detection that, if not first noticed by smell or sight, will almost always be found when tested. So there you have it. The easiest, most natural way to pass a drug test is to simply stop your cannabis use. For mild cannabis users, at least 10 days before your test should be adequate. For heavier users, we’d recommend at least a month. Good luck! And don’t forget, once you’re in the clear you can kick-back, relax, and order cannabis delivery right to your door! Thanks for sharing best advice for passing a drug test. I’m sure people would find very helpful information from this blog. Great tips shared for passing a drug test. Thanks for sharing your deep knowledge. Thank you for that information I quit smoking on the 9th of September and I have a drug test October 10. I don’t smoke everyday but I freaking out because its a really good job offer. So im going to do the natural thing and not smoke for 30 days. passing a drug test is easy. 1. be on a ketogenic diet. if forces the body to metabolize fat which is where toxins are stored. look it up if you dont believe me. most people rely on carbs for energy (carbs include high sugar/fruit). I thought there was no way to beat a hair follicle test. So I started doing some research and read this article. this is really helpful. Thanks for sharing your tips and knowledge. I know this is a few years old but I figured I’d share my knowledge anyways. I passed a urine test in less than 24 hrs by flushing my system and sweating it out. The fastest way to rid your system from thc is to sweat and the fastest and easiest way to sweat (in my mind) is to sit in the sauna. I literally had 20 hrs to study for this test so I went to sprouts market and baught some niacin full flush pills (to open up my blood ways and promote sweating), a gallon of cranberry juice, and a bunch of water. Went to my local 24hr fitness and sat in the sauna for 12hrs. After gruling it out I went home and took a test I bought at cvs and passed. So I went to sleep with ease. In the morning I got called at 6am to take the test and passed with flying colors. Everything I read on the internet said it can’t be done But I proved it myself it can be done. Needless to say i quit smoking pot afterwards. It definitely wasn’t worth the stressed caused buy jeopardizing a $300,000 a year job. I smoked 2 joints of lower grade weed, after being clean. I drank green tea, gatoraid, and Budweiser (yes, BEER). I take multi-vitamins daily (have for years). I took a home test 6 days later, and passed!! Then also passed a lab test a few days later. I’m 54 years old, 6′ 10″ tall, and weigh 180. I read a lot of these blogs, and can say for sure: EVERYONE’S time to detox is different. I eat greens and beans, but also eat pizza, chips, burgers, ect…. My advice is, just don’t freak out and worry yourself to death. I do believe sports drinks, green tea, and water help more than most articles on the internet claim. Cranberry juice is also a good natural thing too. Great article. I remember a friend wanted to pass a drug test and he took b12 supplements, somehow that worked. Thanks for writing! The quickest way to get rid of weed in your system in 24hr. Take a 2 spoon of purple spirit add it to a 2litre of water. Shake it well then Drink it all. The next morning go to your drug testing… Nothing will appear. Drop me a feedback for it. You’ll thank me later. I recently used the 5 day detox program from PassYourTest.com and I was clean of THC after 4 days! They gave me 2 marijuana test kits with my order so I could test myself before going into my test for my new job. I felt awesome walking in knowing for sure I was clean! My friends have also used there other products and say they work too.